Have you ever visited a place so wonderful that an urge came over you to just stay? Not, just stay for another day or two, but to stay forever? I have this feeling during most fantastic vacations. The first time I remember this occurring was when I was 10 years old, while on vacation with my family at Ocean City, Maryland. The August temperature was a perfect 85 degrees and the salt air was filled with fudge, French fries, and cigarette smoke (I’m a weirdo who loves the smell of cigs at the beach). My pockets were jammed full of quarters and my brother and I were knocking down 40 pt scores on skee-ball like it was our job. My parents had dropped us off at the arcade at the boardwalk and life was perfect. If a genie had jumped out of a video game and asked us if we wanted to live at the OC Boardwalk forever, there’s no doubt I’d currently be sleeping on the beach with a belly full of fudge and the title of skee-ball world champion. More recently, in 2017 while taking our Airstream to Bend, Oregon and Flagstaff, Arizona, and after spending a nearly perfect couple of days at each location with my wife and two young children, I thought both were the place to be. We had ideal camp sites for our trailer amongst ponderosa pines, the summer temperature was 72 during the day and 50 at night, the local restaurants served up healthy and tasty treats, the people were friendly, and there was enough single track to keep me and my mountain bike occupied for a lifetime. What wasn’t to like? Thankfully, no genie jumped out of our campfire and asked me if I wanted to stay in Flagstaff or Bend – I would have disappointed him and said no. While both trips and locales were fantastic at the time, I don’t think I would have been happy growing up on the boardwalk in Ocean City, MD, or raising my children in Flagstaff or Bend. Living at the boardwalk would have sucked for obvious reasons (you can’t subsist off of Thrasher’s French Fries and Candy Kitchen’s Saltwater Taffy – or can you?). Moving to Arizona or Oregon would have been tough for less obvious reasons. The couple of days I spent in these towns seemed perfect and there was plenty to like about each. However, if I had made a decision to move there, when I was there, I would have been using severely skewed data. How much is housing, food, taxes, etc.? Will my kids like living here? Can I find a job here? What would the commute be like? How easy is it to make all new friends? In addition to keeping a job, parenting children, and maintaining the house, how much time will I realistically be spending mountain biking, skiing, rafting, hiking, etc.? After getting fired a couple years ago, family and friends frequently asked the question, “now that you can live anywhere, are you going to move out West?” Most assumed because my wife and I love the outdoors that we would bolt Maryland for the adventure that locales such as Denver, Santa Fe, Portland, Seattle, Flagstaff, or Bend present. However, after traveling to 40+ states and some 20 countries around the world, there isn’t a place I’d rather live than Frederick, Maryland. For me, Frederick is the best city in the whole entire world to live in. It’s the best because it fits the preferences and lifestyle of me and my family, at this current time in our lives. With a population of around 60,000, the city has just enough of everything that I want. 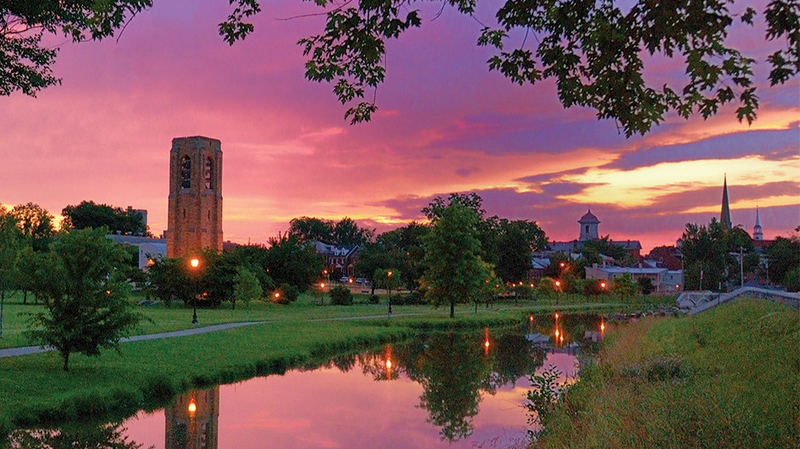 All of these things make Frederick an ideal place to call home. Someone who needs a big city or has to drive into DC or Baltimore everyday or who wants to be at least 1,000 miles away from their parents, Frederick might be the WORST. For me, there is no other place that I want to call home…at this time. Don’t believe me that Frederick is the best? I have a full proof way to convince you to move here. Take off a couple days between the months of April and June OR September and November. Book an Airbnb overlooking Carroll Creek or 2nd Street. Spend some time shopping on Market Street, hitting the single track at the Frederick Watershed, and strolling around Baker Park. In the evening, throw back a couple of pints at Attaboy Beer, grab a bite at The Tasting Room, and then check out a show at the Weinberg. After a perfect weekend vacation like that, you’ll never want to leave. “Vacation bias” aside, Frederick is a great place to live and we would love to have you as a neighbor. If you are considering relocating to the area, contact me and I’d be happy to give you some more reasons to move here.